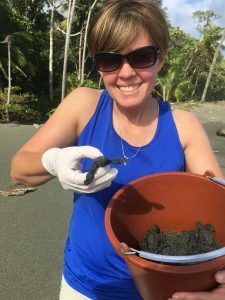 The Osa Peninsula – called the most biologically intense place on Earth by National Geographic – lives up to its status as Costa Rica’s natural treasure. Immerse yourself and volunteer in this wild place. Take in the breathtaking sights and sounds of tropical paradise – all while helping protect this unique corner of the globe! 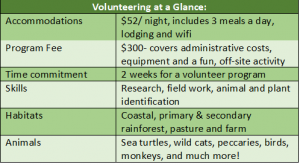 Work schedule: Osa Conservation volunteers work 8 hours a day, 6 days a week. During peak season you may work longer. Commitment: We ask that you commit to a 2-week minimum stay to account for the 2-day training period. The longer you stay, the more you’ll learn! Cost: Please refer to the “Rates“ page for current information on our costs and expenses. Travel: You will be responsible for your own travel arrangements to and from Osa Conservation sites, but if you need us to book a taxi from the airport to our station, please let us know. See our Visitor’s Guide for more information on how to get to our site. Age requirements: You must be 18 years or older to come on your own to volunteer. Volunteers under the age of 18 must be accompanied by a parent or chaperone over the age of 21.